Discussion in 'Grounds Guide' started by Stuarty, Sep 23, 2018. Colchester's ground is absolutely barren. I find the Emirates a bit soul destroying to be honest, everything wrong with modern football perfectly captured in one place. If we're talking about being a dump? Swindon, Luton, Portsmouth are all awful. Nigh on every ground in the 70s was a shithole, Roker Park being the biggest and smelliest shithole of them all..
London Stadium. Went there for the FA Cup third round game. It's just as bad as everyone says it is. The Vetch was probably one of the best and worst rolled into one. Great atmosphere, away fans had a prison to the right with the inmates banging the bars during the match and a passionate North Bank to the left always heighted the atmosphere. Also city centre based with a number of rough edgy pubs backing on to the stadium in the side roads. Hardly ever any families turned up. The facilities were not existent, a rusting staircase from the turnstile to the terrace, a trough to piss in which was always blocked and overflowed and a catering kiosk which was surrounded by a cage which only sold dodgy hot dogs. A long way from the Liberty Stadium which is now a polar opposite. Give me a run down dump (Kenilworth Road, Roots Hall, Priestfield etc.. etc...) over the new soulless holes any day. Notable new hideous grounds are the Olympic stadium, whatever Leicester's is being called these days, Colchester and Shrewsbury's identikit grounds, Ricoh Arena, St Mary's and the Kassam. What makes it worse is the grounds these clubs have come from, sure Layer Road was the pinnacle of utterly shambolic hole fit only for level 8 of the pyramid but it was a million times better than the new monstrosity our dear neighbours now play in. Gay meadow to whatever Shrewsbury are now in, Filbert Street, The Boelyn, Highfield Road, The Dell, The Manor - all stadiums that whilst falling down didn't even need to be a third full to have plenty of atmosphere. There should be some kind of points deduction/relegation for clubs who move from such wonderful grounds to out of town, breeze block, concert venues. This. Feels like you're in a different postcode to the players on the pitch. Agree with most of that but St Mary's isn't out of town, in fact it's bang in the center and next to the church the club originally came from. From my experience the Don Valley has to be #1, not been anywhere like it. I wasn't specifically saying they all are, Southampton's location is good, some of the others are walkable from their town centre's. Leicester's is the worst new breeze block football stadium and of course Oxford's for not even being anywhere near the City or anything at all. Of all the new grounds out there I'd say Swansea's is probably the best I've been to. 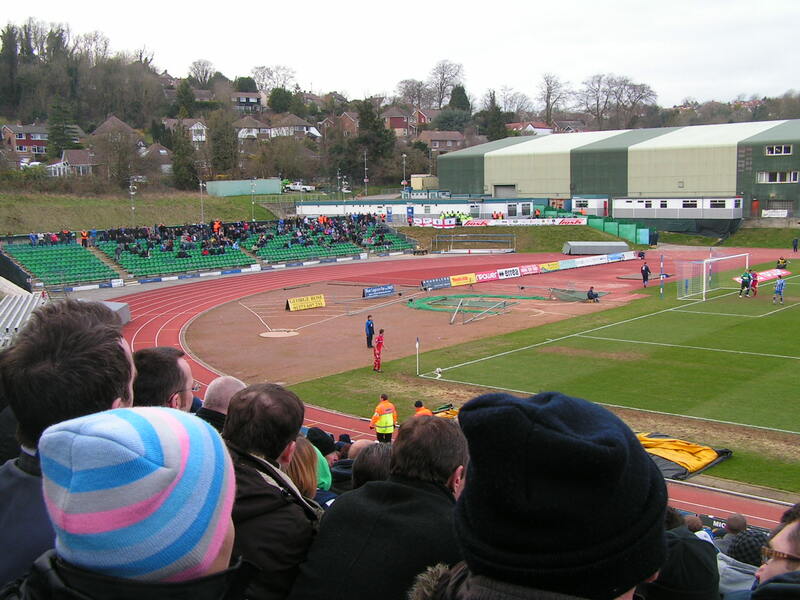 You didn't got to the Withdean then? same issues, same as Gateshead, same as Hornchurch and really the same as the Olympic stadium - athletics venues should not be used as football grounds. I really like the Olympic stadium for athletics but my god it was utterly soulless as a football ground. Missed out on something special. Not to mention our taxes are funding the bastards playing there. Plus they decided to expand it to 66k!!!! Yeovil's away end has to be right up there. Absolutely tragic. It's a terrace, so is immediately better than the vast majority of all other stadiums. It's certainly no fun when it rains though and even less so when you have a crap journey there and see your team lose 1-0. But still it's a terrace and English football is still losing too many of them. I think it's Shrewsbury who are adding safe standing to their ground, about time many more did it.